The Jeep Gladiator will be the star of this year’s Easter Jeep Safari as Fiat Chrysler gives thousands of fans the opportunity to witness the 2020 Jeep Gladiator’s performance up close. Torque News Managing Editor Patrick Rall first reported in his story on the Jeep Five Quarter that Jeep has created six new, custom-built concepts for this year’s Moab adventure. One vehicle, in particular, the Jeep Gladiator Gravity showcases thousands of dollars of Mopar and Jeep performance parts. Fans have been waiting for Jeep to build a mid-size pickup for years. The 2020 Jeep Gladiator sold out its initial run of 4190 debut editions in less than a day. That is one of the reasons that FCA is expecting the Gladiator to be the most customized vehicle in history. FCA finds that 90 percent of its Wrangler owners have at least one special aftermarket part on their Jeep and they expect the percentage to be even higher for the all-new Gladiator. The Easter Jeep Safari is all designed around off-roading on some of the most spectacular terrain in the country. 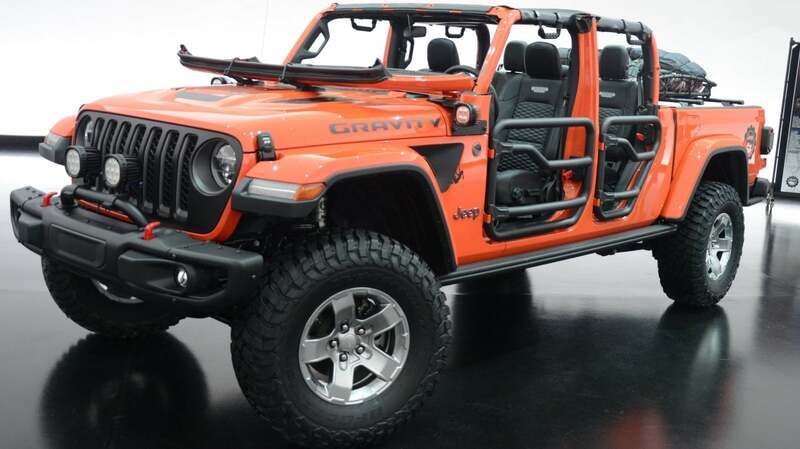 The Jeep Gladiator Gravity is the rock-climber themed vehicle of the six concepts. The Gladiator Gravity is based on the Rubicon version. Most striking on this rugged Rubicon are the two-inch round steel tube doors from Jeep Performance Parts. The Gravity is ready to take on the rocks thanks to a Jeep Performance Parts two-inch lift kit. The Gravity runs on 17-inch gear wheels and is outfitted with 35-inch tires. Jeep Performance Parts also provide the heavy-gauge steel rock rails. Mopar also provides a truck bed storage system with cross rails and additional lockable cargo space with sliding drawers. Like the popular Wrangler, the Gladiator allows you to remove the roof and fold down the windshield. Mopar has an available mesh sunshade for Moab’s hot sun and special tie-downs to secure the windshield. Other Mopar and Jeep Performance Parts additions include an upgraded cold-air intake and cat-back exhaust system, leather seats, satin black grille and seven-inch LED lights. All of the special add-ons for the Jeep Gladiator Gravity are available to buy the moment the pickup rolls off the assembly line. Jeep hasn’t released fuel economy numbers for any of the Easter Jeep Safari Gladiator concepts. The 2020 Jeep Gladiators will be built in Toledo, Ohio. The launch editions were priced just under $61,000. The 53rd annual Easter Jeep Safari will take place in Moab, Utah, from April 13-21.